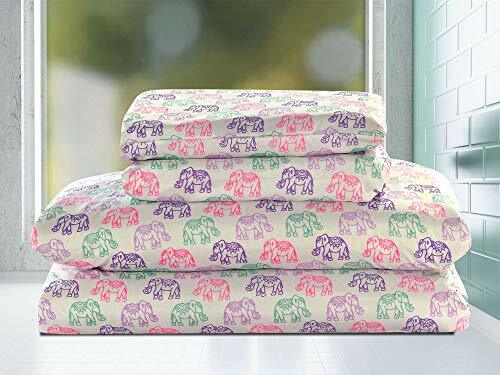 Bring boho to your little one's bedroom with this elephant design twin sheet set. This three-piece set includes a twin size fitted and flat sheet plus a matching pillowcase. Fun shades of pink, purple and teal make up the bohemian elephant pattern. The fitted sheet has a 10-inch pocket depth and an elasticized band for a snug fit. Made from 100% brushed microfiber polyester, this sheet set is soft to the touch. Machine washable for easy care. Fitted Sheet: 39" x 75" + 10"